Waka Ama is more than a sport. It’s a way of life for thousands and the Waka Ama community is to many an extended family. The aroha is palpable when you attend a Waka Ama national event. Yes, the competition is fierce but the whānau spirit is stronger. And in 2019 Waka Ama celebrated 30 years of nationals. Congratulations! 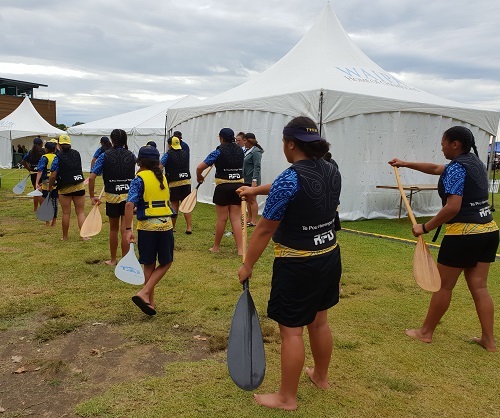 Water safety is a salient aspect at Nationals as it is at club level and WSNZ is pleased to support Waka Ama and the whānau, to embed water safety and Kia Maanu Kia Ora within the community. Specifically, in 2018/19 we're working with Waka Ama Aotearoa to develop safety resources and equip club safety officers to train whānau - across the age range. Flip and Float resources specific to Waka Ama capsize and rescue is a big part of the safety programme as is the opportunity for safety officers to attend workshops and learn how to develop training modules for their club members. 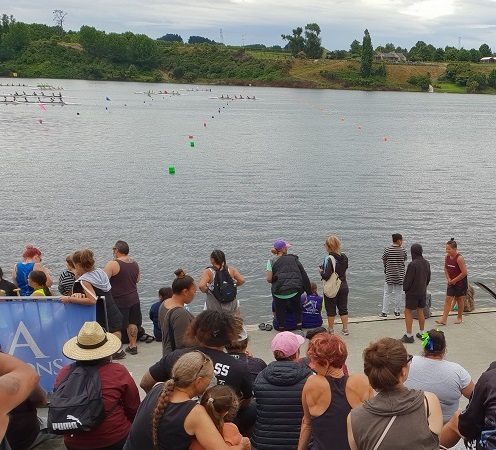 Pictured below left a youth team being put through their paces prior to racing at the 2019 Nationals and right, WSNZ's Sheridan Bruce's view of the racing from the bleachers. Original generation time 0.9008 seconds. Cache Loaded in: 0.0416 seconds.